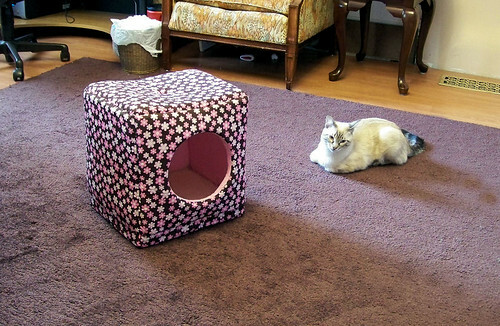 I got my kitty a little “Kitty Cube” yesterday. I’m hoping she decides to make the Kitty Cube her favorite place to nap, because right now her favorite place is my desk chair. :-p If I leave the desk to go fold some laundry or answer the phone, she’s ready and waiting to hop up into my chair and take it over. :-p So whan I come back, I have to pick up this warm, cozy, sleeping little kitty and remove her to the cold, hard couch. I feel so bad. But I am NOT buying her a desk chair! lol. 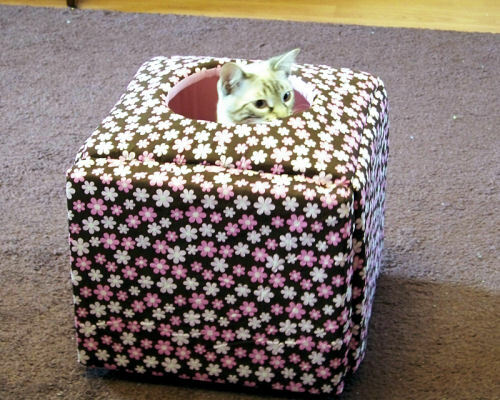 The Kitty Cube will have to do. Here she is, checking it out. Hmm. It smells funny, like a manufacturing plant. I’m hoping the smell will go away. And fast. I need my chair! Ah, after a little warm up (and a few favorite toys thrown into the cube), she hopped in. She tumbled around inside of it. I had the camera ready for her head to pop out! I’m still getting used to the new camera. I did ACTUALLY read the manual, too! But I can’t say that I understood all of it, ugh. I had the settings on the wrong settings, so these photos didn’t come out very well. Nuts, because I think these photos are adorable! I wish they had come out better! In other news, we strapped on her kitty harness and took her outside today. We want to get her accustomed to traveling with us. I don’t think she’d do too well, left alone, while we travel. Do you take your pets along when you travel? Anyway, you can read about her excursion outdoors, here. Gosh, she’s so adorable! Awww….she’s just as cute as a button peeking out of there! Cats are so crazy about boxes! My two go nuts any time I get something big in the mail and then leave the box on the floor. They will play with it and sleep in it until I throw it out!